Promoting Lupus awareness, raising funds and helping Lupus warriors to live life to the fullest Lupus Matters Corporation is always helping to build the community, financially with our economic empowerment seminars. Giving back with our back to school backpack giveaway. Our sunscreen initiative brings awareness to the community on the education of sunscreen and skin protection. On May 14,2018, LMC was recognized as Lupus Matters Day by Governor Nathan Deal. In 2017/18 Douglasville, Conyers & Cartersville recognized Lupus Matters Corporation as Lupus awareness month. LMC, has so many goals to look forward to completing and with the help of its volunteers, we will be successful in accomplishing them. 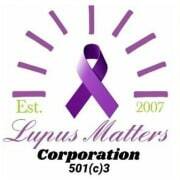 Lupus Matters Corporation accepts donations. Donate Now. Would you recommend Lupus Matters Corporation?